I started off ok, but then it just became too much. I had caught word that there was a burger eating challenge going on, well actually I was invited by Max Carnage himself and Aaron’s Food Adventures. I thought this would be interesting to go down and watch. Next thing I know I have one of these burgers ordered for myself and Max Carnage and Honey Badger are giving me quick eating tips. Well, I did the best I could, but my best didn’t win any awards on this day. I did get a cheer from the crowd and some people were amazed at how much I did end up eating, one was myself. 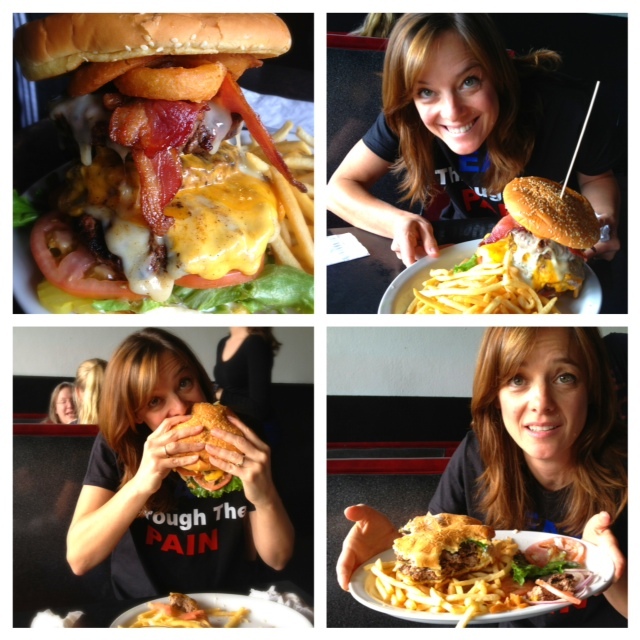 This thing was 4 – 1/2 pound patties and 4 pieces of bacon, onion rings and cheese. Plus all the toppings. I made it through the toppings and 2 patties. I have to say the burgers are awesome. They have good beef and the buns were actually quite tasty. The sauce they use was really good too. This burger normally goes for $25, but for this challenge on this day only, it was going for $10. As always, it’s free if you finish it, the pound of fries and a drink. All other burgers run around $10. Needless to say, mine wasn’t free, but I have enough left overs for another meal, so that’s kind of like winning. Max Carnage of Big Eaters was kind enough to give me a T-shirt and was also kind enough to let me keep it even after I proved NOT to be a big eater. Check out his website and his YouTube page if you want to see some crazy eating challenges. Crazy fun day. I met some great people, saw an eating challenge live that I thought only existed on TV and became so stuffed on some good burgers and I might not eat again for days. Atmosphere at this burger joint is definitely that of a diner. Booths, burgers and shakes. Prices on the burgers are great. Most are 1/2 pound burgers and come with fries. Service here was great. There was lots going on, especially because of the challenge going on, but they were working their tails off and staying on top of things. They do have beer, but I never checked out the selection. The shakes were looking pretty good too. Skyline Burgers on Broadway is located on NE Broadway. Good god that burger is bigger than your head!!! And it’s looks smaller than it actually is. That’s the crazy part.